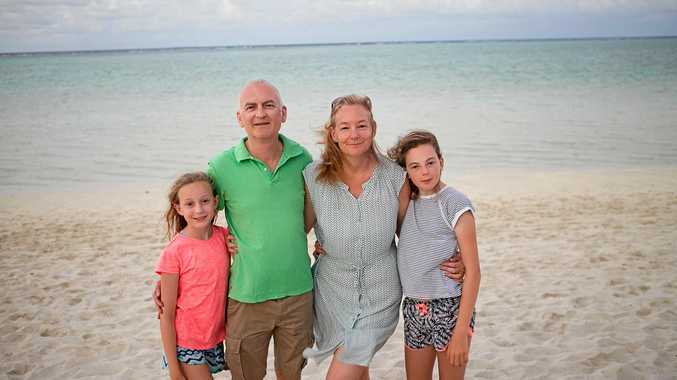 RELIEF: Bianca, 9, Mark, Louise and Rachel Fletcher, 12, at Heron Island after Mark was able to join his family when he recovered from a medical emergency. "I THINK I'm having a stroke." When Sydney businessman Mark Fletcher felt his face tingling, that is all he could say to the man sitting beside him during a Brisbane-to-Gladstone flight. The 58-year-old father was bound for Heron Island for a family holiday when he suffered what doctors believe was a transient ischemic attack, or a minor stroke. "About halfway into the flight I noticed the lid of one of my eyes seemed heavy and the muscles on one side of my mouth were twitching slightly," he said. "I thought this could be the warning signs of a stroke." Mr Fletcher, sharing his story to thank the health services who helped him during the unexpected medical emergency, said within five minutes of the initial signs, one side of his face was paralysed. Mr Fletcher, who considers himself fit and healthy, said that within 15 minutes he felt a strange 'pop' in his head and the paralysis rapidly disappeared. He said the QantasLink cabin crew and pilot requested a priority landing at the Gladstone Airport and arranged for the Queensland Ambulance Service paramedics to meet them upon arrival. After the paramedics assessed him, they recommended a visit to the Gladstone Hospital. Mr Fletcher had numerous tests, including a CT scan that ruled out a brain bleed. His doctor spoke with specialists in Brisbane via video link, who also helped assess his condition. 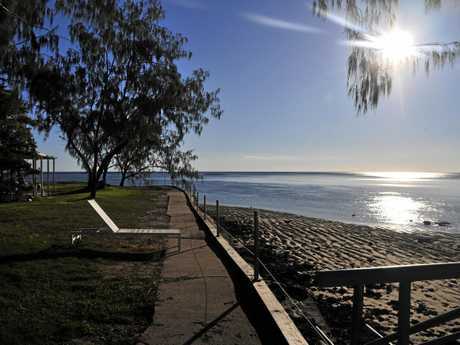 Despite hopes of being discharged from the hospital before the 2pm ferry left the Gladstone Marina, doctors recommended Mr Fletcher stay for overnight monitoring. "Regardless of staffing levels, availability of diagnostic technicians, it being a weekend, and the fact there wasn't a neurologist on staff, regardless of whatever circumstances they had to work under, I felt well looked after," he said. "I know that many base hospitals away from metropolitan areas have had to deal with funding freezes and cuts, downsizing and often actual neglect. "And I understand that such conditions can negatively affect staff morale and services. "I wanted to say that the friendly and sympathetic treatment I received from everyone involved, and the level of care I received while at the hospital, was fantastic." Mr Fletcher had a 'cautious discharge' from the hospital the following day and doctors explained in detail what he should be mindful of following the minor stroke. While Mr Fletcher and his wife Louise had visited Heron Island before, it was the first time for their daughters Bianca and Rachel. He said the holiday "exceeded expectations". The highlights were watching the turtles lay eggs and the hatchlings scamper down the beach. Since returning to Sydney, Mr Fletcher has met his general practitioner and will soon complete follow-up tests.